In this post I am sharing a practice I have been following. I call it bag in bag strategy. If you find it useful, feel free to adapt. I have two bags- one smaller camera bag and one larger back-pack. The larger one from FB Fashion Bags is about 5 years old and was with me during almost all my trips. Camera Bag was purchased an year later. The smaller bag is a camera bag with dedicated compartments for the main camera and lenses, holds GoPro, battery and such small accessories. It has got an outer pocket and pouches- which can hold water bottle/selfie stick/umbrella and such stuff. 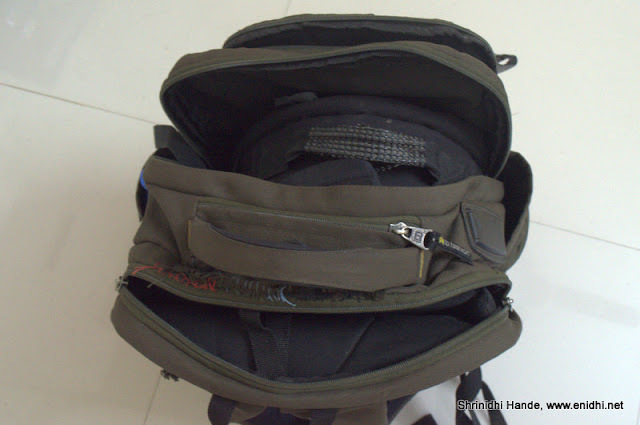 The larger bag has 3 main compartments- one with padding for laptop, another one which can completely engulf the smaller bag and a smaller pouch on the end, besides few zip pockets. Solution: Enter the aircraft with only one bag (Bag in bag) so as to comply with one bag only policy and once at your seat, remove the inner bag and store both bags in the overhead cabin. Once the inner bag is taken out, thickness of larger bag drops and both can fit into cabin. This is true for Volvo buses also, where overhead cabin height is limited. Scenario 2: Visit home town with one bag but family wants you to take back lots of food n such stuff. Scenario 3: Exploring the city- Keep the bigger bag in a locker/hotel room (like I did in Canberra) and move around with smaller bag. Scenario 4: Railways sleeper coach- upper birth: If I keep the entire bag with me on the upper birth, I will have reduced space for sleeping. If I keep the bag below (under the lower birth) there is a risk of theft. Solution- keep the smaller bag with valuables close to be in the upper deck, store the bigger bag with low value stuff under the lower birth. Nothing much to lose in case of theft. Scenario 5: Overcrowded cabin: At the aircraft door, airline staff may insist that they need to check in you bag and store it in the cargo hold, since overhead cabin space is all used up. This hasn't happened with me yet and if you have valuables like laptop and camera usually you will be allowed to take it into cabin. However, if situation arises, I can do similar to Scenario 4 and check in the bigger bag. Bigger bag needs to be selected wisely- the regular rucksacks won't work for me because 1. they may not have laptop padding, 2. too big a size won't fit in cabin. Too small a size then it either can't hold smaller bag or won't have enough space for additional stuff after taking in the smaller bag. Regular bags with wheels hamper mobility, so not that ideal for short trips. End of life: In Feb 2016, the 5 year old bag started showing signs of its aging. Cracks appeared in the top and kept widening. I did some makeshift sewing to hold it in place and it lasted another 5 months, but doesn't look like it can hold much longer. Few suggested trying professional repair, but it looks like the material has gone weak and professional stitching may not help. It has also started failing at few other places such as spot where back strap joins the body. If there was no need to pack a laptop last minute during most of the trips, I am sure the bag would have lasted longer. I might have to discard this bag soon, so using this post to show some respect to this bag which has been a great companion on my trips. Yet to find a replacement- Looks like exact model is not listed on sites anymore. SB498 is the closest I could find. Of course everyone has a camera bag and might be using similar approach knowingly or unknowingly. Your comments welcome. Update:New Bag is here- by Livia, purchased at Roshan Bags- Rs 1080 after 20% discount- same as online price. it is similar in shape, size and features compared to the outgoing bag let me see how long it lasts. When you are researching for your next backpack, I'd urge you to take a look at the Tortuga Travel Backpack. 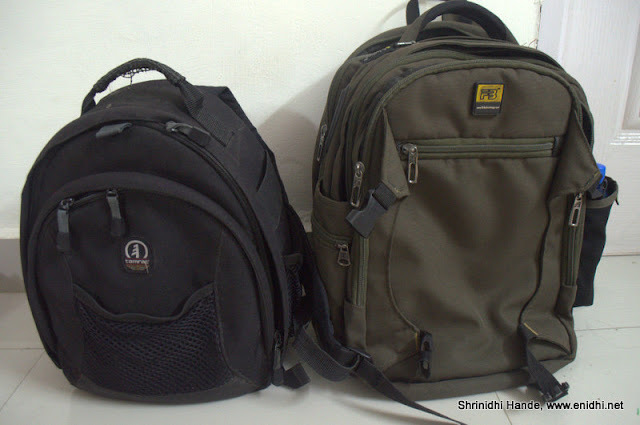 After a lot of research (I wrote about it on Preethika's blog - How to choose a good travel backpack), I ended up buying one and the bag has made my life so easy since then. Perfect carry on size, fits in Volvo buses, and has a ton of space for you to carry anything and everything (used it for a 11 day trip, waiting to do a longer one with it). 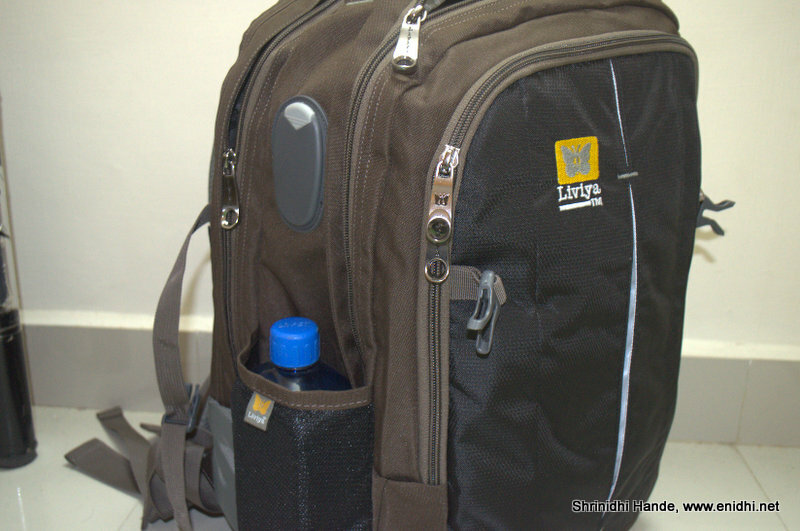 Your bag is well travelled :) I have a Puma foldable duffel bag which I use in same scenarios. Never tried with both Backpacks. Great idea. @Sims: Good to know. Duffel bags are too small and can't hold laptop, so I don't prefer them much. I use the bag in bag strategy too. Bag in a bag! A very smart idea. 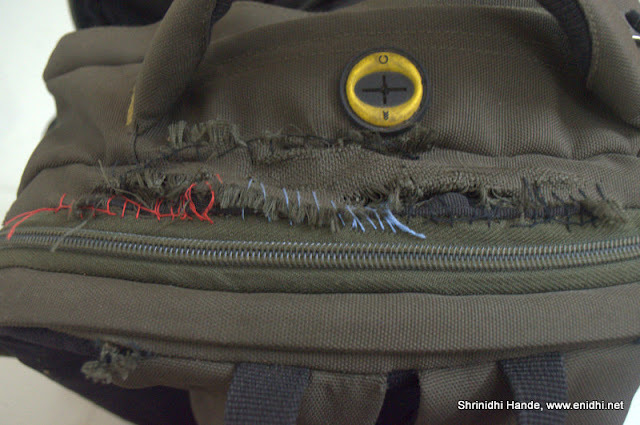 If you had fixed the bag by professional stitching ,it would have held together for longer-my personal experience.Ofcourse you need to find a good bag repairer,same is the case with zip.Stitch in time saves nine. Depending on how often you use the bag independently you might also want to choose a bag with no option for water pipe on the top or plug the option ,water might seep in if you do use it independently. On a purely durability perspective ,unintentionally you may end up putting loads heavier than the bag is actually meant to carry and hence might end up loosing on that front. @The Wild- true. Professional stitching would have got it longer life- not just stitching- cloth line also need to be added as the material fatigue has developed in that area. That hole for earphone/waterpipes are unavoidable in most bags, but position will vary which I can factor. I don't use it much so will keep an eye on this. True. Sometimes overloading 1 bag is more practical than carrying two lighter bags. Can't help much. Axis Bank ATM Fraud-You could be next victim!